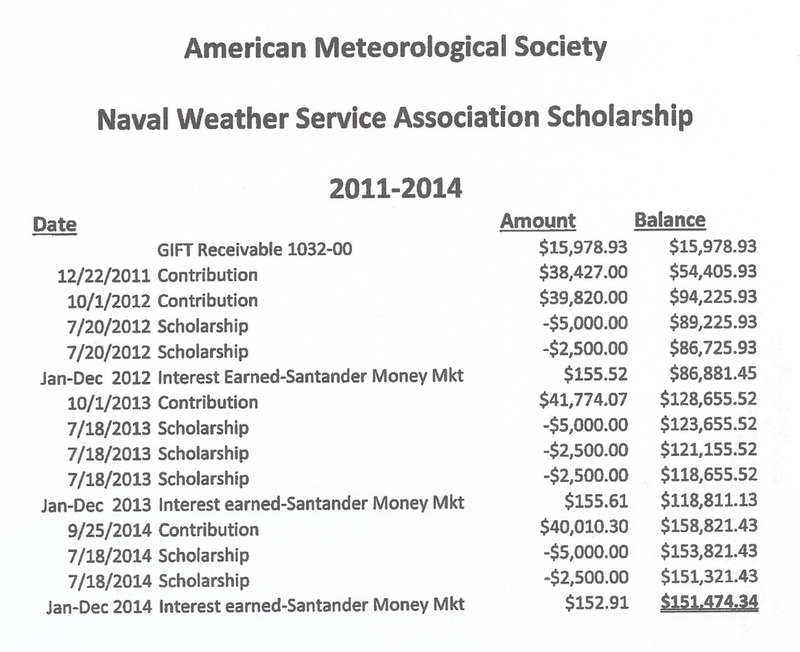 In 2012 the American Meteorological Association (AMS) began administering the The Naval Weather Service Association Scholarship. To apply, please visit the AMS website and follow application instructions. I want to thank all who have continued to support our scholarship fund. The Association can be very proud of our two annual awards. 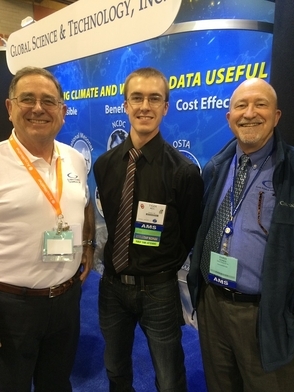 We are supporting the education and development of real meteorologist and atmospheric scientists. The program that the AMS is administrating is exceptional. I had the opportunity to spend some time with these two great guys in Austin TX at the AMS Conference. 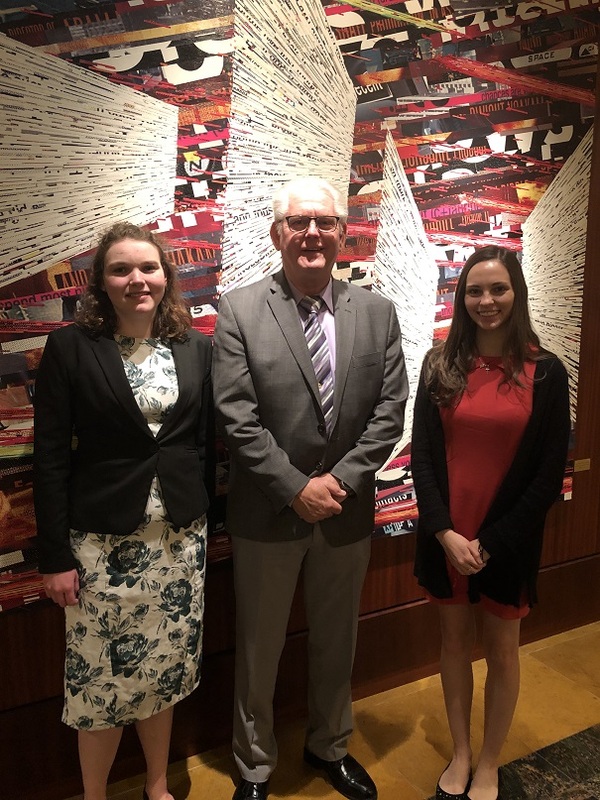 I was really impressed with both student and can say with great confidence that our scholarships are being awarded to students that will great things in Meteorology and the Atmospheric Sciences. Daniel, a student at North Carolina State University and has already be doing research studying the variances in snowfall when compared to different inversions. Great Stuff! 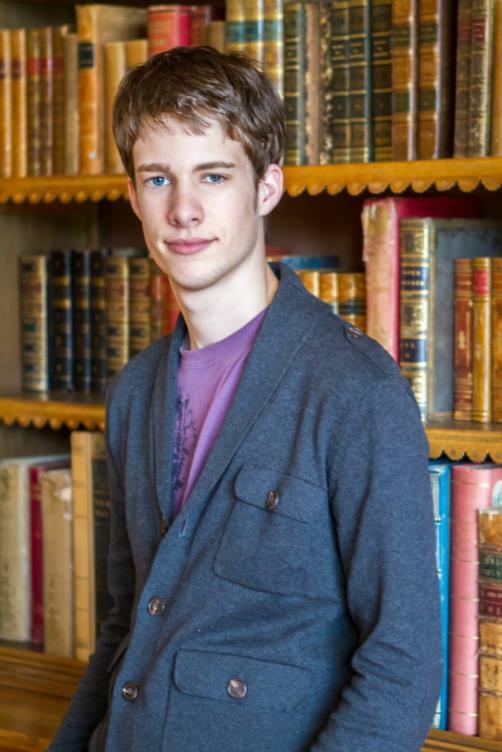 He is also double majoring in Mathematics. 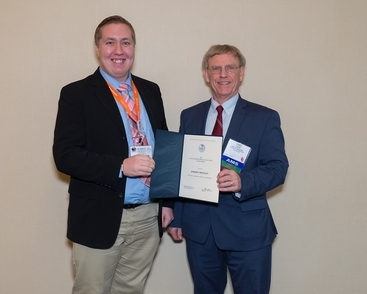 Sean, a senior at Oklahoma State has been studying emergency communication as it related to tornados and other severe weather events and how to improve both the forecast so that people respond appropriately. In our conversations I could tell that he got it completely, the need to convey serious life threatening forecast in a manner that would get results. Both students mentioned to me how important our scholarships were to them personally. Sean in particular said that our award was allowing him to pay his own tuition this year taking pressure off his family and that he would be able to graduate nearly debt free. He was so grateful. Robert Prestley, on left, (2016 NWSA Named scholarship recipient), and Alexander Tomoff (2014 freshman scholarship) with Fred Carr, AMS President, at 2017 AMS Meeting in Seattle. 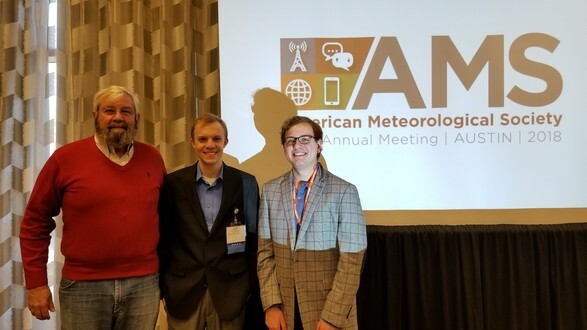 Robert Prestley (2016 NWSA Named scholarship), Mike Gilroy, and Alexander Tomoff (2014 freshman scholarship) at 2017 AMS Meeting in Seattle. Jessica, who is a graduate of Westlake High School in Austin TX, is attending the Department of Atmospheric and Geographic Sciences at the University of Oklahoma, in Norman. Jessica plans to specialize in severe weather prediction. 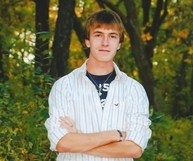 Robert, who hails from Sheboygan WI, is attending the Meteorology Department at Pennsylvania State University. 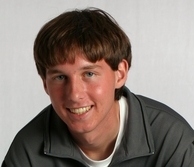 Robert’s undergraduate interests are tropical and synoptic meteorology, as well as weather forecasting. His plan is to go to graduate school in a meteorology or social science field, focusing on how to improve communication of weather hazards, balancing the needs of the general public with the realities and uncertainties of the science. Tyler Bell, 2013 NWSA Scholarship Recipient, (center); NWSA member Chris Moren (l) and Mike Wooster (r) at January 2015 AMS Meeting, Phoenix. Interests: Concentration is in hydrometeorology and microclimatology; specifically how water and carbon interact in the lower atmosphere and surface. Future goals: Madison ultimately would like to aid in agricultural drought monitoring and/or research on water use efficiencies of crops. 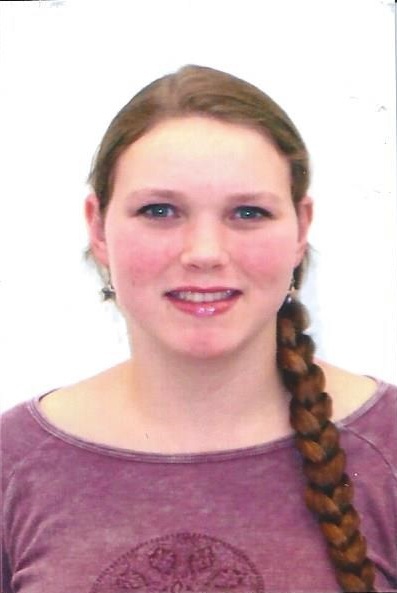 She is also interested in pursuing a career that is more linked to hydrology. Madison’s detailed press releases will become available sometime in October and will appear in the November Aerograph…Editor. 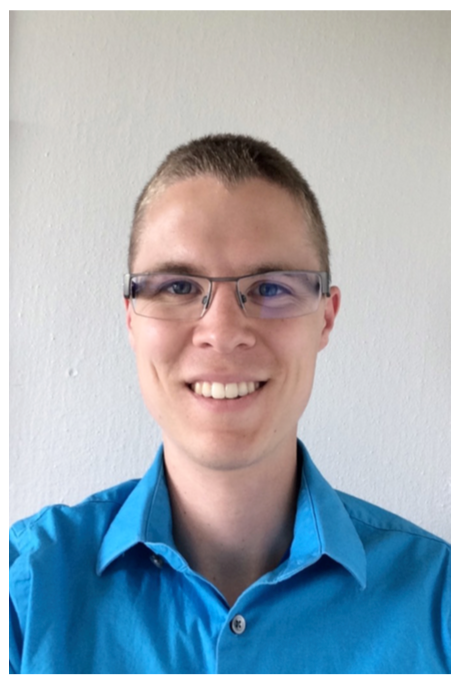 Interests: I am mainly interested in studying synoptic meteorology, forecasting and weather risk management. Alex’s detailed press releases will become available sometime in October and will appear in the November Aerograph…Editor. I was born and raised in the small town of Somerville, TN to my loving parents, David and Cindy Alford. After attending high school at Fayette Academy in Somerville, I journeyed to Norman, OK to attend the University of Oklahoma to major in meteorology. 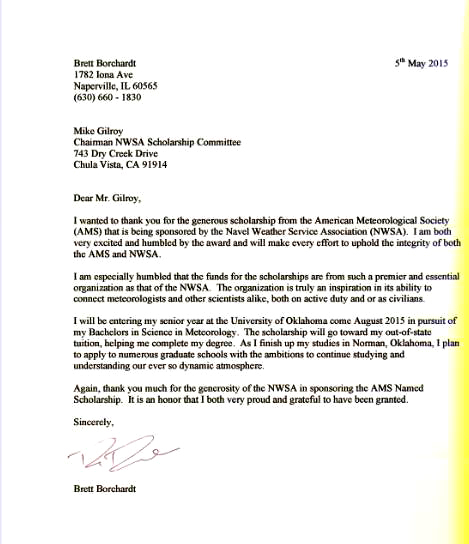 At OU I have had the pleasure of being involved in multiple student organizations including the Student Chapter of the American Meteorological Society of which I am currently the president, the Oklahoma Weather Lab, and the School of Meteorology Peer Mentoring Program of which I am the coordinator. In my academic career, I am a member of the OU Honors College, hold a minor in mathematics, and attended a study abroad semester at the University of Reading in Reading, England during the spring of 2013. 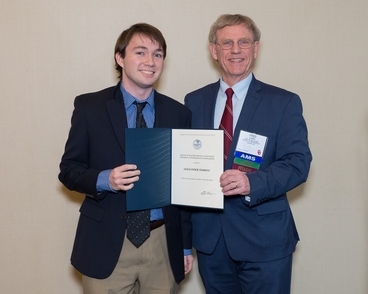 I have also been awarded the NOAA Ernest F. Hollings Scholarship, the Award of Excellence from OU, Honorable Mention to the College of Atmospheric and Geographic Sciences Outstanding Senior Award, the Outstanding Service Award from the School of Meteorology, and John T. Snow Study Abroad Scholarship. Currently, I am an undergraduate teaching assistant in the School of Meteorology and an undergraduate research assistant for Dr. Michael Biggerstaff, director of the Shared Mobile Atmospheric Research and Teaching Radar program. My plan is to attend graduate school where I will pursue a Ph.D. in meteorology. After completing my Ph.D., I hope to begin in a research laboratory or a university. Although it is not my immediate goal after my Ph.D., I hope to eventually become a professor at a university. 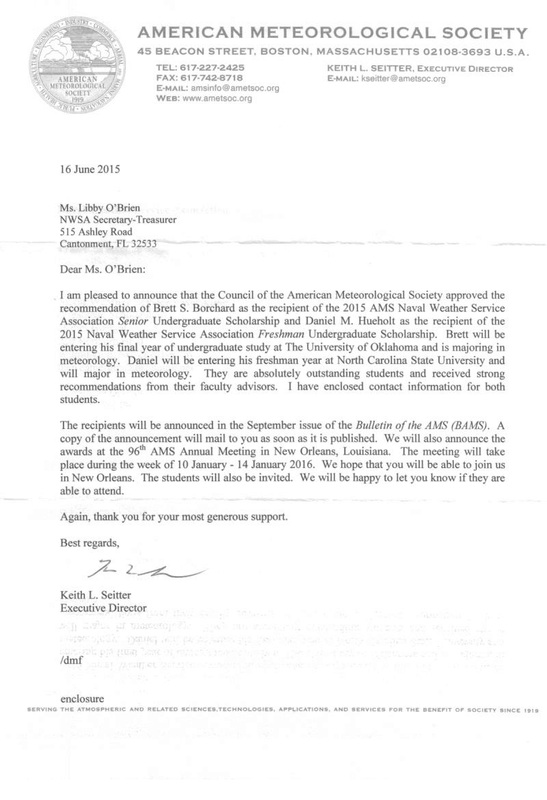 Editor’s note: The award will be presented at the 94th AMS Annual Meeting in Atlanta, Georgia on February 5th, 2014. Lloyd Corbett, NWSA CMAA, will represent the NWSA at the awards. His Undergraduate interests include: Tropical meteorology, especially researching how hurricanes intensify. 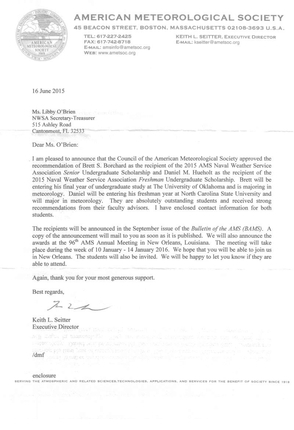 “I will be conducting research on this topic at the Hurricane Research Division in Miami, FL this summer”. Tyler Bell of Bartlesville, OK. Tyler is currently a junior undergraduate at the University of Oklahoma majoring in Meteorology. Please send in your Donations to NWSA and keep our program going for a long time! My name is Morgan Gorris and I was a recipient of the NWSA Scholarship in 2010. 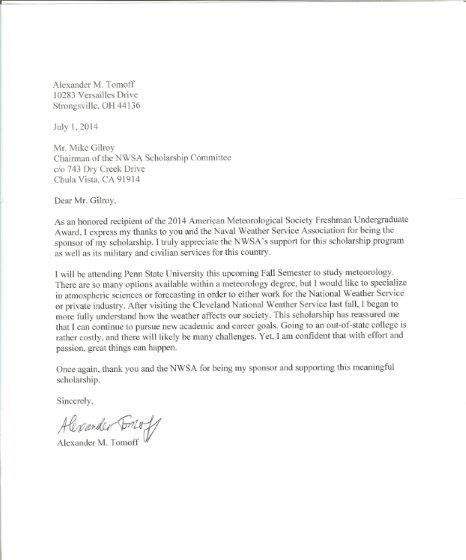 I would like to follow up with the NWSA to thank you again for your generous contribution and inform you that I am still pursuing, and highly enjoying, my meteorology career! I am now a junior at The University of Michigan obtaining a degree in Earth System Science and Engineering with a concentration in Meteorology. I have acquired a keen interest in applying my skills to aviation meteorology. I have also been learning a lot outside of the classroom. Last summer I completed an internship at NASA Ames working to develop an Android application to aid Alaskan general aviation pilots. This summer, I will help test radar equipment as I go storm chasing in TX/OK throughout the month of May through Texas Tech, and then I will complete a summer internship at MIT’s Lincoln Laboratories helping to analyze FAA system of rerouting air traffic due to convective weather. I am looking forward to another grea! t summer of learning and am proud to be able to share my accomplishments with you. I thank you again for your support. It's been a while since I updated you on the progress of my career. 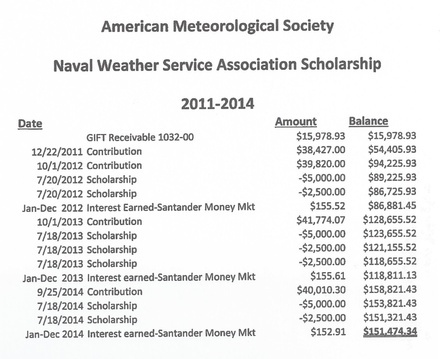 As you'll recall, I received the Naval Weather Service Association Scholarship in 2010. This award lightened the financial burden of completing my degree, which I was able to accomplish in May 2011. I decided to pursue graduate school and applied to Stanford, Cal Tech, and UT. I was accepted into Stanford and UT, and decided to continue studying here at my alma mater. I will be completely my Master's degree this spring in Aerospace engineering and will begin a PhD program in Computational Engineering the following fall. I am very excited about what the future has in store for me!